Frank, My husband and I are delighted with our tumblers. I ordered 18 to start and we were so happy with them, I ordered 18 more. I will be adding more to our set in the future. When I called you from our home in MI, you offered prompt and courteous service. Our home is filled to the brim with art from all over the world. 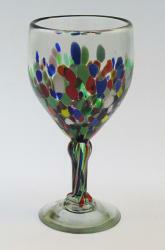 We are excited to serve beverages to our guests from true works of art. They will also make wonderful gifts! Thanks so much! Thank you for your gracious suggestion. I will remember that, and I will certainly consider your store for myself and friends in the future. Just excellent service and communication. Thanks again, and great doing business with you. Frank is the kind of guy that will bend over backwards to make a customer happy. We purchased some hand blown glasses from him and he did an excellent job of matching them up rather than just grabbing 12 glasses and shipping them. Thank you so much!!! Just got them and they are BEAUTIFUL!!!! To Kristina, thanks for the Happy 4th. 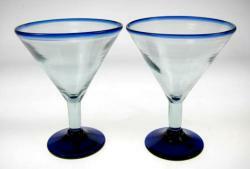 Good news, on my trip to Mexico I was able to locate 12 blue spiral rim 20oz glasses. The price would be the same as the 16oz glasses. Hi, Frank! What fast service! Thank you so much. I love these glasses! It's funny how we came to order them. I have had just 1 (bought it in San Antonio) for many years and that is my "nightly wine glass". The other night my hubby accidentally knocked it over on the counter and he felt sooooo badly and within 5 minutes he had googled "bumpy wine glasses" and he was led to your site! LOL. I just rec’d the two glasses… I LOVE them. Thanks, yes they got here ok, I will be buying more from you soon. 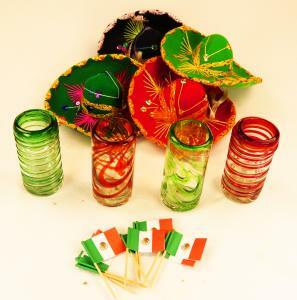 Just wanted to let you know I received the margarita glasses and both I and my son and his wife whom I gave these to, think they are just beautiful. I want to thank you for getting them to me in a quick time and they were wrapped so well and did not break. Thank you again. Thanks Frank, I appreciate your prompt service. The glasses look beautiful with my fiestaware!